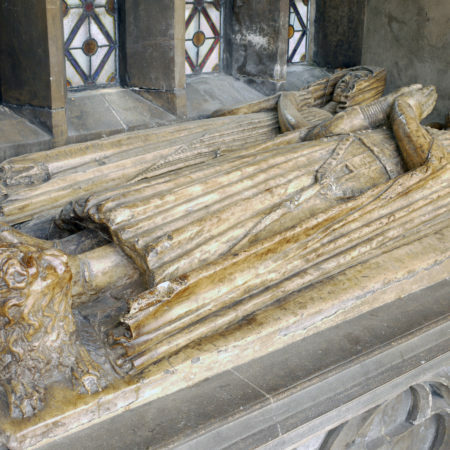 In the south aisle of Holy Trinity church, Hull (Yorkshire) is a tomb monument with effigies of a civilian and wife carved from the local Ledsham alabaster resting on a tombchest decorated with shields within quatrefoils. The whole is within an ornate canopied niche, which is cusped and subcusped and has an ogee gable with blank panelling to the left and right. The effigies are carved in a singular way suggestive of local workmanship. It has been subject to some restoration. An engraving made by Basire for Richard Gough before 1786 shows the man’s hands as having been broken off, but they have been replaced and the broken figures of supporting angels smoothed off. The book held between his hands may not therefore reflect the original design, although a heart held by his wife is authentic. Who is commemorated by this tomb has been the subject of vexed debate. The accompanying notice in the church is headed ‘the de la Pole tomb’ and quotes the opinion of many antiquaries. 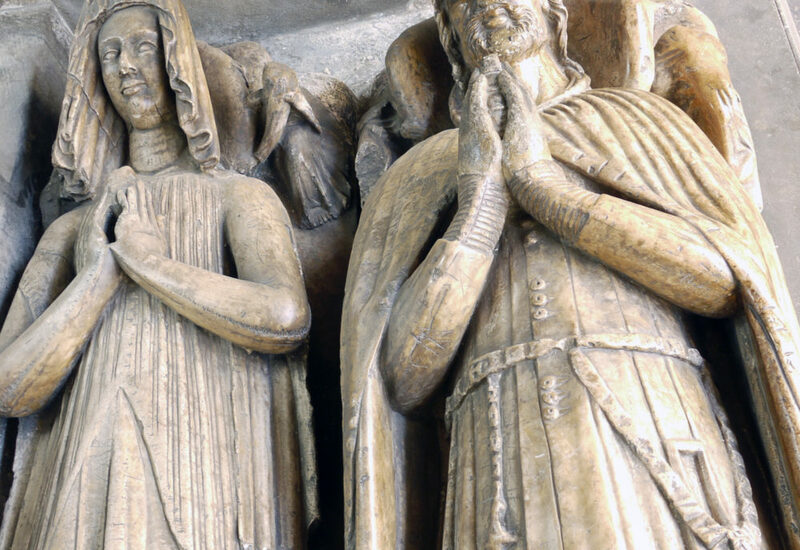 Candidates include various of the de la Pole family members and their Wingfield connections, but the two most popular suggestions are Richard de la Pole (d. 1345) and his wife, and his brother William de la Pole the elder (d. 1366) and his wife Katherine Norwich. Yet both can be ruled out. Civilian costume is not always easy to date with precision but a date in the range 1380-1390 for her closely-gathered over-gown with straight sleeves seems likely. 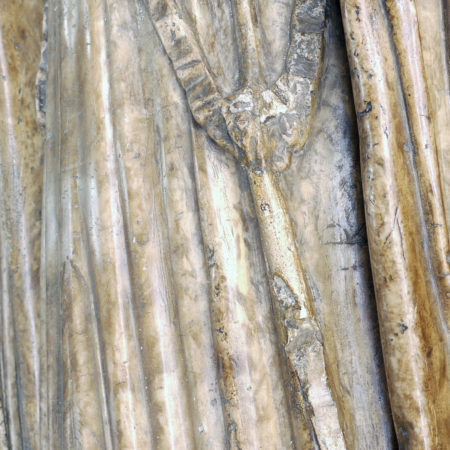 The bulky veiled headdress of the lady is remarkably similar to that shown on the female effigy on the Marmion tomb of c. 1387 at West Tanfield (Yorkshire). Hence a date of c. 1380-90 seems indicated. Such a late dating would exclude Richard de la Pole as a candidate as he died in 1345 and probably also William the elder (d. 1366). Moreover, William’s wife, Katherine Norwich, like other later members of the family, chose burial in God’s House Hospital at Hull, commonly called the Charterhouse, which, according to her will, was planned by her husband, William de la Pole, but not actually established until after his death in 1377. He left the choice of his burial place to the discretion of his executors. 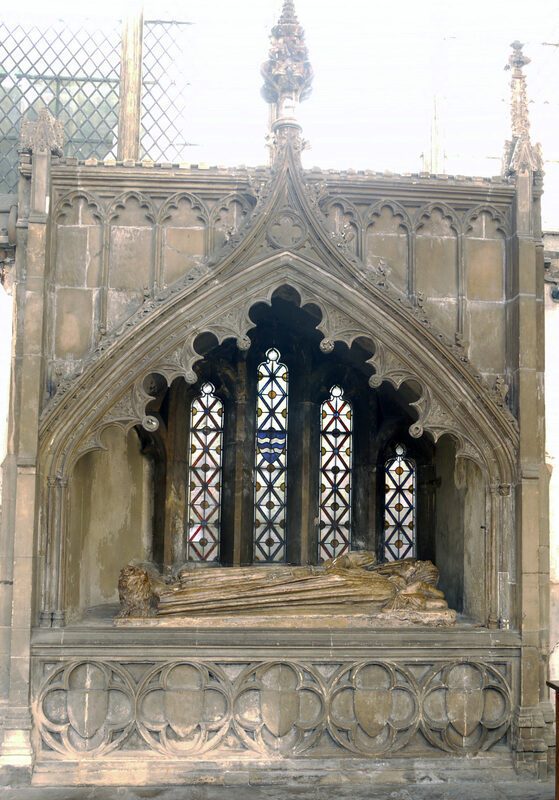 Whether he was temporarily buried in Holy Trinity and subsequently removed to the Charterhouse is uncertain, but what is clear is that their joint tomb is recorded as having been placed beneath the high altar of the priory church. A significant clue as to the identity of the civilian and wife at Hull is that he has dangling from his belt a probe, used by wool merchants for testing the quality of wool. It is highly unlikely that the upwardly-mobile de la Poles would have chosen to be shown as wool merchants. As is often the case, antiquarian notes provide the clue to the couple commemorated. 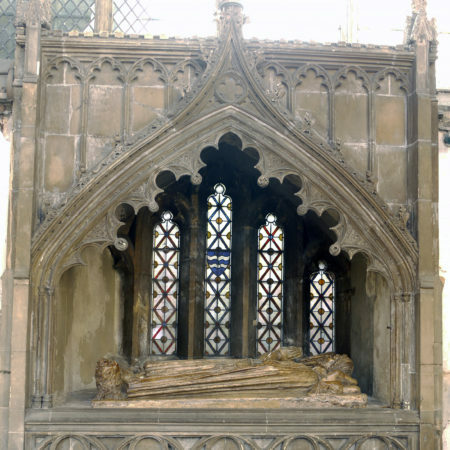 The antiquary, John Leland, who wrote his ‘Itineraries’ in the years 1535-43 visited Hull; he recorded that ‘Selby is buried in the south side of the waulle of isle by the quire: and his wife also, with very fair images’. Richard de Selby was a prominent Hull merchant of the Staple of Calais, who traded, inter alia, with Gascony and the Low Countries. He served at least six times as mayor of Hull. In 1382 he was one of the two most generous donors who contributed £4 each to the cost of making Hull’s charter. He was associated with Holy Trinity church as early as 1361 when £5 raised by Hull Corporation by means of a special duty on wool exports was placed in the keeping of him and Walter Box ‘for the work of the church’ perhaps the completion of the chancel. In 1375 he and his wife Emma Ravenser obtained licence to grant lands in Hull worth £10 a year to the priory of Guisborough. In return the priory was to maintain a chantry priest in Holy Trinity Church, and twelve poor men, each of whom was to receive ½d. a day. The hospital is believed to have stood on the north side of the churchyard. In the same year, Robert, Richard and Emma established the Ravenser chantry in a chapel off the south aisle of Holy Trinity church near the tomb in question. 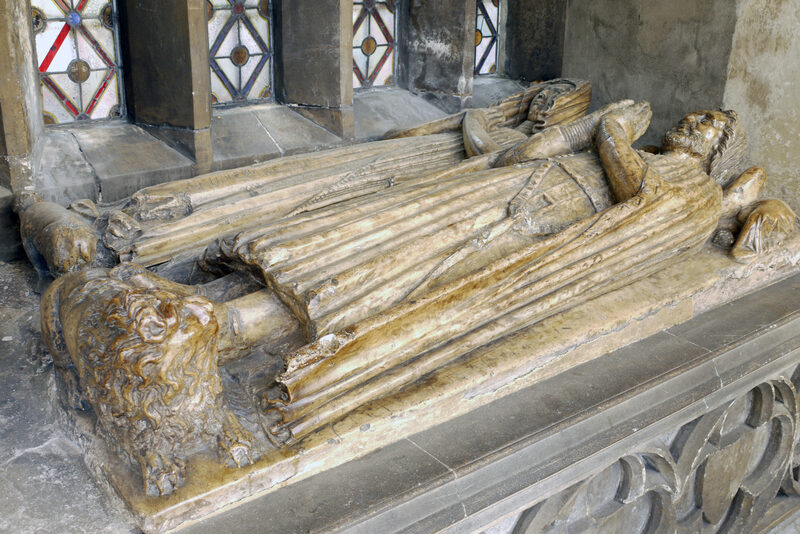 Robert de Selby died in 1390, but whether the monument was commissioned in the couple’s lifetimes or after his death is uncertain.